^ L. B. Holthuis (1980). “FAO Species Catalogue Vol. 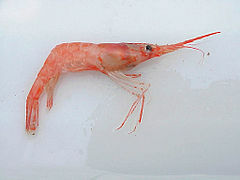 1 - Shrimps and Prawns of the World: An Annotated Catalogue of Species of Interest to Fisheries”. FAO Fisheries Synopsis 125 (1): p. 138. ISBN 92-5-100896-5. ftp://ftp.fao.org/docrep/fao/009/ac477e/ac477e22.pdf.